A specter is haunting us … the specter of baby terrorists! U.S. Representative Louie Gohmert (R-TX) has revealed the very real possibility of terror cells plotting to breed future terrorists inside the United States. Gohmert issued the warning while defending Arizona’s immigration law, which the Department of Justice is now officially challenging in court. Yes, Gohmert would like us to believe in the very unreal possibility of pregnant Mexican woman risking their lives to cross the hot sweltering desert or swim across the Rio Grande into the United States to raise their kids with a hatred for America. Now we know why 6-year-old kids are on a “terror watch list” and why Republicans like Rand Paul are so afraid of the 14th amendment that grants citizenship to everyone born in the United States. They are alarmed that alleged terrorists would give birth to babies in the United States, raise them somewhere else, and send them back here in a couple decades to destroy the country. After all, what’s worse than an “anchor baby?” It’s a baby that may grow up to make bombs! 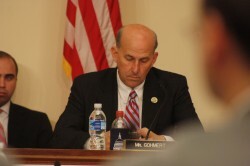 Gohmert and other Republicans are watching too many Hollywood flicks on the job. It is a wonder that they haven’t labeled President Obama as The Manchurian Candidate yet. Oh wait, he’s been labeled that by right-wing nuts for quite a while. Maybe this is a good sign that Republicans might just allow abortions to quell their fear of fetuses who are already making plans to destroy the American way of life. After all, in safeguarding America, no child should be left behind.